I find the uproar astonishing because it’s obvious that Letizia is easily the prettiest and most stylish of the two. Kate still dresses like a rich girl who just graduated from college, and this has been her pattern for the last ten years. 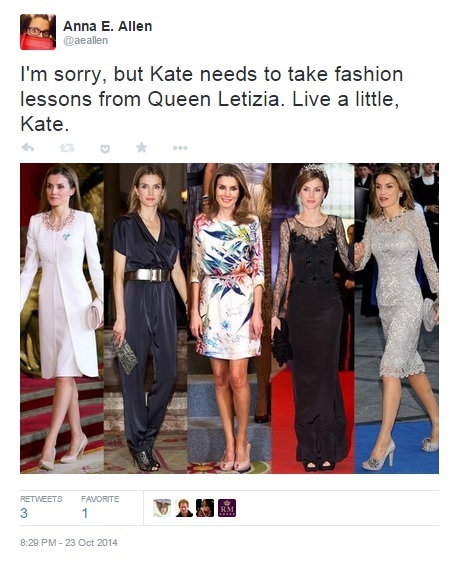 Letizia shakes things up regularly while Kate seems to stick to one or two looks in various colors for daytime and for evening looks. Oh she has them in various colors, but basically she repeats the same look over and over. Letizia and Rania of Jordan are both lovely, appropriate and stylish, and fashion forward. I also admire Mary and Marie of Denmark, the Countess of Wessex and the Duchess of Cornwall. I am confused by people attacking you for stating the obvious. Various polls have shown that Kate is not particularly revered as a royal, and that people overwhelmingly wouldn’t want to be her, or even necessarily meet her. I think the blowback is because she’s pregnant. You were right in what you pointed out. I like the girl, but honestly, I am suffering from Kate fatigue syndrome. Fashion is such a superficial thing for people to get upset about. It’s not snarking their personal appearance, their character, etc. It’s literally what they choose to wear, and it’s usually only worn once or twice–at that! So I was shocked to find out people were so offended by a statement about fashion! It’s fashion! Who cares?! It’s all subjective. And I really had implied that Kate embrace her Duchess-status and be herself! She can be fierce, too. I have no doubt she could be a fun gal, but she seems to be letting someone turn her into Stepford wife… Oy vey. Who knew Letizia was such a threat, apparently! kate needs lots of pampering to stay pretty, if she appears too often she does not look pretty at all, she is not naturally pretty, she needs lots of grooming to stay that way, leti and mary honestly look the same age with her yet shes ten years younger and works less!